Get the latest Instagram, Facebook, and YouTube Influencer Marketing insights in your inbox every Friday! We’re excited to launch first edition of Grapevine’s #ThroughTheVine series! Every week, we’ll pick — fresh from the vine — the top stories and news items to help you navigate the wacky and dramatic world of Instagram, Facebook, and YouTube Influencer Marketing. Click to watch #ThroughTheVineThis week: we talk about Viacom’s big moves. 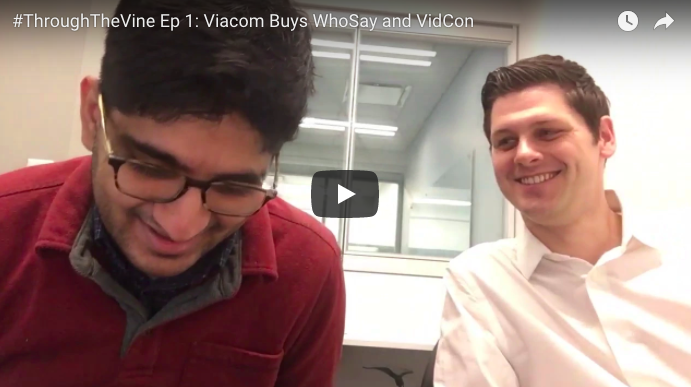 Within a span of two months, Viacom has both acquired WhoSay, an influencer marketing firm, and VidCon, perhaps the largest conference for online video creators and enthusiasts. Grapevine CEO, Grant Deken, joined me to talk about this in the first episode of #ThroughTheVine. Click the video above to watch! You can also read more on our blog. I swear to the ghost of Tom Brady’s ego that I’ll stop writing about Logan Paul one of these days, but as long as this guy causes drama I will never stop posting. Anyways, Logan Paul has posted a series of videos that has received strong criticism from animal welfare groups like PETA. Since then, YouTube has banned ads on his channel which will curtail his revenue. Note that Paul bought a $7M dollar house last fall and with more than 50% of his revenue evaporating thanks to his behavior, expect him to lean in on pushing his merch. The worst kept secret in the world of Influencer Marketing and digital media is that Snapchat is struggling. In a (I read, desperate) bid to attract more advertisers to its platform, Snapchat is offering “several hundred dollars” in free credits for vertical ads on the app. Snapchat is trying to build out its programmatic ecosystem and this is clearly a play to try to increase its pool of advertisers to make their ads more competitive. I say, good luck, Evan Spiegel! As Instagram and YouTube Influencer Marketing becomes more prolific and widely used, so too does the necessity of safety. At Grapevine, we’re committed to ensuring both brands and influencers can team up to create engaging content that is of the highest quality. This means working diligently behind the scenes to make sure content doesn’t run afoul of the rules. To that end we’ve made two important updates to our Influencer Marketing Platform that’ll make following the rules seamless so creators and brand partners can spend 100% of their effort and energy on creating amazing content.